Patty is home and doing really good, I am so grateful to you for all your help and for such a wonderful gym he loves it. I enclosed some pics of him on there he loves the toy will the bell. I will send more later. 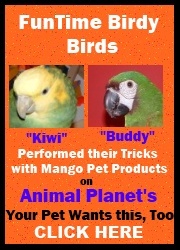 Thanks a bunch I tell everyone about you I just gave your name and web site on a parrot group too. Hope you get lots of business. Patty's favorite toy is yellow dinosaur you sent . God bless you, you are so wonderful Ann.